The National Lawyers Guild and several legal and human rights organizations have called on the U.N. Human Rights Committee and the U.N. Special Rapporteur on Torture to launch a formal investigation of the United States government’s continuing violation of human rights of five political prisoners known as the Cuban Five. NEW YORK - September 27– The National Lawyers Guild and several legal and human rights organizations have called on the U.N. Human Rights Committee and the U.N. Special Rapporteur on Torture to launch a formal investigation of the United States government’s continuing violation of human rights of five political prisoners known as the Cuban Five. The Five are Cuban Nationals who are being imprisoned without a fair trial or sufficient proof of culpability: Antonio Guerrero Rodriguez, Fernando Gonzalez Llort, Gerardo Hernandez Nordelo, Ramon Labañino Salazar and Rene Gonzales Sehwerert. They were arrested in 1998 and charged with conspiracy to commit espionage and conspiracy to commit murder, among other lesser counts. The ability of the Five to make an effective defense was compromised, if not eliminated, by the actions of the United States government. First, following their arrest, the Five were kept in solitary confinement for 17 months, during which limited communication with their attorneys and restricted access to evidence inhibited their ability to mount an adequate legal defense. Second, access to documents containing evidence for their defense was impaired. Finally, the climate of anti-Cuban bias and prejudice in Miami against the accused rendered it an unsuitable place for a trial in violation of Article 14 of the International Covenant on Civil and Political Rights, to which the United States is a party. Guild President Marjorie Cohn said, "The treatment to which the Cuban Five have been subjected, especially being held incommunicado for 17 months awaiting trial, constitutes cruel, inhuman and degrading treatment which violates the Convention Against Torture and Other Cruel, Inhuman and Degrading Treatment and Punishment, as well as the International Covenant on Civil and Political Rights. The United States has ratified both treaties, which makes them part of U.S. law under the Supremacy Clause of the Constitution." Oral arguments in the appeal of the case of the Cuban Five were recently heard on August 20, 2007, in Atlanta, Georgia. The five Cuban nationals still remain under the same conditions and are each being held in different prisons throughout the country. Not only are they away from their family, which violates the sanctity of family, but two of the wives have repeatedly been denied visas to visit their husbands in the United States. These severe, prolonged systemic violations are in need of international attention, regardless of the outcome of the August 20 arguments. Groups signing on to the letter are the American Association of Jurists, the Center for International Policy, Global Exchange, the International Association of Democratic Lawyers, the National Conference of Black Lawyers, and the National Organization of Legal Services Workers NOLSW/UAW Local 2320, AFL-CIO. Founded in 1937 as an alternative to the American Bar Association which did not admit people of color, the National Lawyers Guild is the oldest and largest public interest/human rights bar organization in the United States. Its headquarters are in New York and it has chapters in every state. Washington, Sept 16. One of the most predominant US attorneys tells the story of the intimate relations among the Bush family, the grandson of an ex dictator, two people considered the worst terrorists in the Western Hemisphere, the Nicaraguan Contras, the FBI and the CIA and how this converted five anti-terrorists into a threat to US national security. It's a story that, were it a novel or a Hollywood screenplay, would be considered improbable. But incredibly, it is a true story. All that is needed is a little anecdote to prove it. Once, one of the men who had been guilty of among other things, killing 76 people, and participated in attacks on civilians, murders and in secret illegal wars, sought to return to the United States to live peacefully in one of its principal cities and enjoy life in his third age, to walk his dog and be hailed by his fellows as a hero. The US State Department recommended that he not be permitted this luxury and officially, after an extensive review of his adult life, classified him as "one of the worst terrorists of the Western Hemisphere." His friends ask for assistance from an aspirant for the governorship of Florida, one Jeb Bush. He, in his turn, obtains a young lawyer to take the case. Everything works out well because the president of the United States ignores his State Department's opinion, pardons the man and allows him to establish legal residency as a free man in Miami. Meanwhile, the politician becomes governor of Florida. A few years later, in 2002, a Florida Supreme Court position came vacant. The governor remembered his lawyer friend and postulated him for the post. He was approved and is now a member of the State Supreme Court. The name of the lawyer, now judge, is Raoul Cantero III and is no less than the grandson of Fulgencio Batista, the ex dictator overthrown by the revolution led by Fidel Castro. And the man who today walks peacefully on the streets of Miami, invited to sit in the first rows of official events, including when Jeb's brother, President George W. Bush, visits Miami, is called Orlando Bosch. Today he can be found in Miami with his intimate friend Luis Posada Carriles, accused of the worst terrorist acts committed in Latin America. "Everything is still business as usual," comments Leonard Weinglass, one of the country's legendary attorneys who, among other cases, participated in the defense of Daniel Ellsberg and Tony Russo in the Pentagon Papers scandal, defended some of the famous dissident leaders in the 60s and 70s, was attorney for the daughter of President Jimmy Carter and others, and who is now one of the attorneys in the case known as the Cuban Five. He spoke about this case in a forum at Howard University Law School to mark the ninth anniversary of the arrest of The Five. Weinglass offers these anecdotes –such as how during the famous Ellsberg case, in which on orders of President Richard Nixon a crime was committed to obtain negative information, during the trial of those who leaked secret information about the political decisions on the Vietnam War, during the trial, tried to offer the judge the position of FBI director– to give a political context and precedents of Executive Power intervention in the system of justice, such as has developed in the case of the Cuban Five. 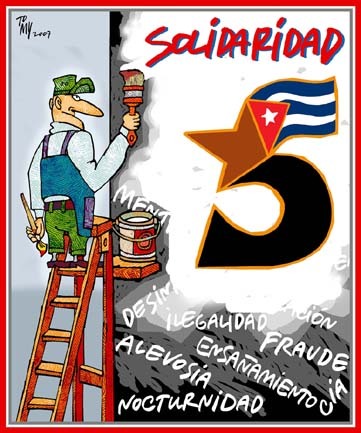 The mission of The Five was to infiltrate anti-Castro movements in Florida that planned and committed acts of terror against Cuba and to send this information to their country, information which is credited with saving the lives of innumerable potential victims. When Cuban authorities invited the FBI to review the information about terrorist attacks and other illegal activities that were planned from within the United States, Washington decided not only not to act against these Florida groups, but to arrest those who were trying to prevent these terror plots. The Five were arrested on September 12, 1998. Their trial was held in Miami, epicenter of anti-Castro power, in a city controlled by the forces and allies of Bush, Bosch, Posada Carriles, leaders of the Nicaraguan Contra and veterans of secret illegal CIA operations. "This is one of those criminal cases that naturally, because of the charges, would involve facts of national security and foreign policy," Weinglass commented. This case, like that of Ellsberg, has elements in which foreign policy plays a central role and where the White House directly intervenes in the judicial process, he pointed out. The case of The Five, he stressed, must be understood within what is, for many US citizens, "an untold history of low scale war emanating from a country 90 miles away. A war in which more than 3,000 Cubans have died and that has cost millions in damages." After the collapse of the Soviet Union, the tourism industry became key for Cuban economic survival, he explained, and for that reason became the target of terrorist attacks by anti-Castro groups, something announced openly in a press conference in Miami, in which it was declared that Cuba is a "free-fire zone," a term used in Vietnam to designate an area where anything that moves is subject to attack. They began putting threatening and putting bombs in hotels and killed an Italian tourist in a hotel, and more. There were no consequences from US authorities against those who declared this campaign from Miami. Cuba protests every one of these acts to Washington and the United Nations - All without response. Weinglass explained that, given this situation, Cuba decided to send five men to infiltrate the mercenary groups that perform armed military drills in which ex CIA agents participate, and which prepare attacks against civilians "the exact legal definition of terrorism." The US government knows of all this. And that is when Cuba invited the FBI to review all the information – including photos and documents – and offered the names of those involved in these illegal acts so US authorities could take legal action. They didn't do any of that but Washington decided to arrest The Five, accusing them of "conspiracy to commit espionage." "These five went to this country to investigate, in a nonviolent way, without weapons, groups that had committed murders," Weinglass said, and ended being accused of trying "to destroy the United States," in the words of the federal prosecutors. Although the case always lacked real proof or witnesses, "the trial was held in Miami, without any possibility of an impartial procedure," he added. Weinglass noted that the 60,000 Cuban exiles control almost the entire city from the mayoralty, the chief of police, the local FBI office and the principal media. The Five were declared guilty and condemned to a total of four life sentences plus 75 years in prison. The well-known lawyer detailed the evolution of the case from the first trial and how, when this injustice was appealed, three federal appellate court judges, for the first time in legal history, reversed a federal judge's decision regarding venue, considering that conditions in Miami made it impossible to hold an impartial trial, and ordered a new trial. But the US government responded to reverse this by presenting a new charge: conspiracy to commit murder, concerning the downing of two anti-Castro planes by Cuban airplanes. Weinglass related that the prosecutors knew they didn't have a solid case, and up until the verdict was announced they were already soliciting an appeal but, as the trial was once again in Miami, the jury declared them guilty of the crime. Soon after, ex Attorney General Alberto Gonzales (the same who resigned last week) ordered the prosecutors to appeal the three-judge decision and managed to reverse the case again. The US judicial process continues slowly in this case, and Weinglass says, "now it is a matter beyond laws, this is about justice." Thus Gerardo Hernández, Antonio Guerrero, Ramón Labañino, Fernando González and René González have served nine years in US prisons for the crime, according to their defenders here and throughout the world, of fighting "terrorism". Judge in the case against Pinochet: "I honestly believe that a court that seeks justice must absolve The Five." *Former judge and dean of Chile Central University Law School. Judge in the case against Chilean dictator Augusto Pinochet. •"As a judge, I honestly believe that a court that seeks justice, the rule of law and social peace must absolve The Five." In 1996, 26 small planes, piloted by anti-Castro Cubans left Miami on different days and flew over Cuban airspace, dropping propaganda against the government. The Cuban government protested and warned the United States that it would exercise its legitimate right to defend itself and would adopt more drastic measures to prevent this violation and possible terrorist acts as had caused the death of 73 people in 1976. Shortly after this warning, three small planes again flew over the Island's airspace and two were downed by the Cuban armed forces, with the death of four Cubans who were contra the Castro government. It was necessary to blame someone. So, in 1998, the US government accused five Cubans who had infiltrated terrorist groups of exiled Cubans that were constantly plotting strategies to sow terror in Cuba and discourage tourism to that country. The Cubans: René González, Fernando González, Antonio Guerrero, Gerardo Hernández and Ramón Labaniño saw their lives fall apart as a result of a lie. A necessary lie, such as that which permitted the US to invade Vietnam, Afghanistan and Iraq and that will one day allow it to invade Iran, an oil-producing country. It told the world that the five were guilty of conspiracy to commit espionage and conspiracy to commit murder, among 24 other charges. These were never proven because the facts never existed. It is one thing to infiltrate terrorist groups that are trying to attack your country and another to spy on another country. The US government claimed the latter. Nevertheless a trial took place in Miami with a jury terrified by the activist Cuban exile population. It is established that in order to intimidate the members of the jury, besides threats, their photos were taken as they entered or left the courtroom, as were photos of their auto license plates. The jury found the five guilty, resigning the Cubans to from 19 years in prison to life imprisonment. It should be made clear that these men joined distinct terrorist groups for the single legitimate purpose of the right for their people to know the plans hatched against them and to prevent those plans from happening. For this the Cuban Congress proclaimed them heroes. One of them became involved with groups directed by Orlando Bosch, who made it known to the world in June 1976 that he was the brains behind the in-flight explosion of a Cuban civilian plane that murdered 73 people. This person also participated in Operation Condor (the network of police and military of the dictators in the Southern Cone of America that murdered "internal enemies"), and in the attack that cost the lives of the former Chilean Foreign Relations Minister Orlando Letelier and US citizen Ronny Moffit,. And so, because they tried to be the rearguard and protectors of Cuba, these men were labeled terrorists, which shows us we are in a world wrong way round: a world where those who struggle for peace and security are locked up. While those truly dangerous, those who daily take the lives of innocent people, continue immune in their ivory towers. This is the reality that confronts The Five, who stoically and with great strength are engaged in the legitimate struggle to regain their freedom by proving they never committed espionage and never had plans against the United States. It is worth repeating that the supposed espionage is a US government machination to dishonor the Cuban nation, the only one that has been able to confront the northern giant without ever being defeated. In August of this year I had the opportunity to participate as an international observer at the oral hearing of this case before the Atlanta Appellate Court. I was able to appreciate there had been no espionage, there was not one single classified document in evidence, there was never danger to the United States and there had been no conspiracy. There are witnesses, US Army generals, who declared that the country was never in danger by the activity of the Cubans. As a judge, I honestly believe that a court that seeks justice, the rule of law and social peace must absolve The Five. It is a fact that the US prosecutors harassed the judges on 28 occasions. I present one concrete example of this harassment: a public prosecutor told the president of the court of appeals that he did not know the complete file, but only the part the defense agreed to. This pressure had the objective to remind the court that the US government knew what was happening and would not permit a decision in favor of the Cubans. One of the defense attorneys, Leonard Weinglass, insisted that the Miami jury was incapable of a fair judgment in that venue. The terms "espionage against the United States, homicide, conspiracy or terrorism" were enough to make that jury predisposed to pronounce against the Cubans. This trial is a political case that has nothing to do with law, but is a result of pressures. It is time that the story of these Cubans takes the course of justice so they can return to their island, the breasts of their families and continue serving their homeland as they did before the unjust accusation against them by the US government. Delegates of Latino organizations from around the United States will gather from October 5th to the 9th to attend the Second Annual Latino Congress 2007. The Congress will take place at the Sheraton Los Angeles Downtown Hotel, 711 South Hope Street, Los Angeles, California. This Congress is convened by several national organizations including the League of United Latin American Citizens (LULAC), the Mexican American Legal Defense and Educational Fund (MALDEF), National Alliance of Latin American and Caribbean Communities (NALACC), Southwest Voter Registration Education Project (SVREP), William C. Velasquez Institute (WCVI) and many others. The central activity of the Congress will be the convening of concurrent workshops in the morning and in the afternoon. The workshops will address issues that affect the Latino community in the United States including the impact of Latino voting, U.S. foreign and trade policy implications for Latinos, strategies on climate change, immigration reform, and strategies on issues of health care and social security, and Latino policy initiatives on education. On October 6, the 31st anniversary of the terrorist bombing of the Cubana airliner in Barbados, a workshop entitled “The war on terror and its implications for Latinos in the United States: The Case of the Cuban Five” will bring together Leonard Weinglass, one of the leading Attorneys of the Cuban Five , Jose Pertierra, Attorney representing the government of Venezuela in the extradition case of Luis Posada Carriles, Rev. Lucius Walker, Executive Director of IFCO/Pastors for Peace, and Delvis Fernandez, Executive Director of Cuban American Alliance Education Fund. The workshop will start at 2:30 pm. Members of the International Committee for the Freedom of the Cuban Five will have an informational table throughout the Congress with literature about the Cuban Five including videos, books and brochures. Were it not true, one might have thought that it had been dreamed up by a mystery writer. Let’s set the stage. The US government was approached by a Latin American country in the 1990s with information about terrorist activity being carried out against it — the Latin American country — based in the USA. The US government said that they would look into it. Instead of looking into it, the US government arrested alleged agents of this Latin American government and ultimately imprisoned them, agents who had been collecting information on the terrorist activity based on US soil. Sound familiar? This is the case of the “Cuban 5”, individuals arrested, tried and imprisoned in the USA. Convicted in 2001, their case is currently in appeal, but the circumstances of the case are nothing short of bizarre. The actions by the Cuban 5 were never aimed at the US government, but instead involved the monitoring of activities by Cuban exile groups here in the USA. In moving against the Cuban 5, the US government alleged that they should be held accountable for the Cuban government shooting down the planes of the exile group called “Brothers to the Rescue,” an organization that flew illegal flights into Cuban airspace and was repeatedly warned to cease and desist. The entire circumstances of the Cuban 5 become more and more curious when one looks into the situation. For instance, the US government has agents all over the world focusing on obstructing the activities of alleged terrorist groups. These agents have different mandates, including imprisoning alleged terrorists in other countries. 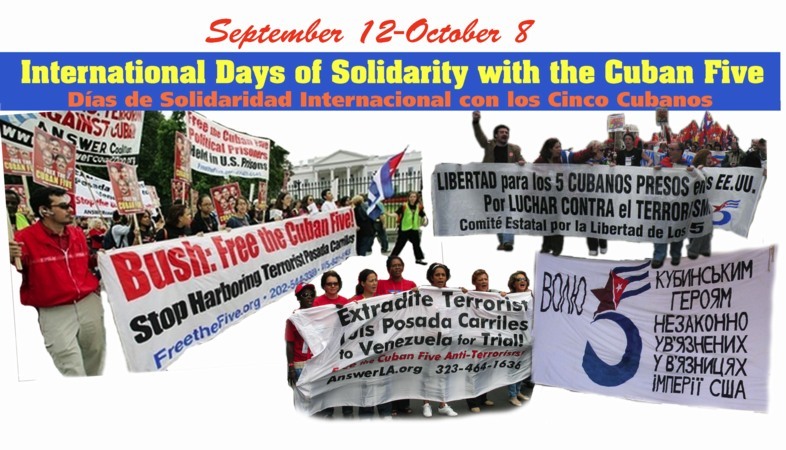 In the case of the Cuban 5, no military action was carried out on US soil by anyone connected or alleged to have been connected to the Cuban government. Cuban agents did not kidnap terrorists and take them to Cuba. Yet, the Cuban 5 were arrested and imprisoned. The Cuban government provided the US with information on terrorist activity based in the USA. With this information the US obviously knew that there were Cuban agents collecting intelligence on these groups. The Cuban government would certainly not have provided the US with information that would have led to the capture of alleged agents if those alleged agents were planning ANYTHING against the USA. So, one might ask, where is the threat? To add insult to injury, while the Cuban 5 were arrested and imprisoned, a gentleman who has been quite openly associated with terrorist activity against Cuba — Luis Posada Carrilles — has been permitted to walk free in the streets of the USA after the Bush administration “bungled” the case against him. Thus, an individual implicated in the bombing of a Cuban civilian airliner — in which all the passengers and crew were killed — is alive, well and free in the USA, while individuals who were in the USA to prevent terrorist activity and work with the USA to eliminate such activity are imprisoned. While we should be use to untruths from the US government, and most especially the propaganda coming from the Bush White House, the case of the Cuban 5 stretches all credibility. Each time the Bush administration yells “terrorism,” the people of the world are asked to walk lock-step in line with the proscriptions of the White House. Yet, when other countries identify clear and demonstrable terrorist activities, i.e. military activities directed against civilians, the Bush administration engages in a sniff test. If it sniffs and determines that the terrorist activities are being carried out against those who challenge the USA, the activities are either ignored or applauded. If it sniffs and determines that the activities are being carried out against allies of the USA, even if those allies are tin-potted despots, then such activities are condemned as high crimes against humanity. The Bush administration wants it both ways. If we remain silent about such hypocrisy, then they will indeed have it. BlackCommentator.com Editorial Board member, Bill Fletcher, Jr. is a labor and international writer and activist, and the immediate past president of TransAfrica Forum. Havana, September 27 (acn) A new order issued by the Fifth Circuit of Appeals of New Orleans, Louisiana, has granted the US administration another thirty days to present arguments on the case of notorious terrorist Luis Posada Carriles. According to a notice published on the U.S. Court PACER systems on Wednesday, October 24 is the new deadline for Washington to appeal the decision made in El Paso, Texas by Judge Katlheen Cardone, by means of which terrorist Luis Posada Carriles was found not guilty for minor immigration charges. According to Cubadebate online, no word is said about the date when the lawyers of Posada Carriles should respond to the report issued by the attorneys. The court of Appeals of New Orleans had previously set September 4 as deadline for the US government to present a summarized report to appeal the case. The federal attorneys had presented a two-page ambiguous report on June 5 appealing Cardone´s decision. Cuban born and nationalized in Venezuela, Luis Posada Carriles is responsible among other crimes, for masterminding the blowing in mid air of a Cubana airliner that claimed 73 civilian lives off the coasts of Barbados, in 1976. Last May 8, Judge Cardone rejected the case for migratory fraud built against Posada Carriles and put forth, in a 38-page document, her decision that "the defendant is a political hot potato" and it was up to the Executive Power (The White House) and not her court to judge him as a terrorist. WEEKS after the Miami Herald claimed that a Newark, New Jersey grand jury had completed its investigation into the sponsors of Luis Posada Carriles and that prosecutors were handling the case in the terrorist’s favor, the Star-Ledger, New Jersey’s largest newspaper, revealed that the grand jury is in fact continuing to investigate businessmen in the Cuban exile community. While the terrorist is freely walking the streets of Miami, interacting with his network of murderers, Bush’s legal apparatus continues with its strategy of buying time for the old CIA agent. In fact, the two central characters in the operation to finance many of Posada’s terrorist actions carried out from El Salvador — businessmen Abel Hernández, a resident of Cliffside Park and owner of the Mi Bandera Supermarket in Union City, and Arnaldo Monzón Plasencia, owner of the Arnold Stores chain in the same city — are now resting in peace. According to the Star-Ledger, the grand jury has just summoned Lourdes López, assistant to Hernández, and Albín Martínez, former owner of a local Western Union agency. Martínez revealed that the two deceased men and their accomplices had sent more than $30,000 to Posada to finance his anti-Cuba terrorist activities during the year 1997. The grand jury has also looked at the participation of Oscar Rojas, who worked as an accountant for more than 20 years for Monzón Plasencia. However, that individual was excused from testifying when he appeared before the court on February 15, 2006, according to his legal representative, Gilberto García. Apart from Hernández and Monzón, the two main figures of the conspiracy that is being investigated, the name of an assistant to Congressman Albio Sires also appears: terrorist Angel Alfonso Alemán, also implicated in the case of La Esperanza, the yacht accidentally intercepted by the Coast Guard in Puerto Rico as it was heading for the Venezuelan island of Margarita in an attempt by those aboard to assassinate President Fidel Castro. No reference to the actual political role of Alemán and his involvement in that terrorist action has been published to date in the New Jersey or Miami media. Alemán’s son, José is also suspected in the case. According to the New Jersey newspaper, the FBI has expressly forbidden witnesses from contacting the media in any way, an apparently useless precaution. It is striking that during the time Posada was engaging in his campaign of terror against tourist locations in Havana, causing the death of Fabio Di Celmo, not one representative of the U.S. legal system bothered –even for a minute— the two businessmen and their Miami partners in the Cuban American National Foundation (CANF), even though the CIA and FBI could not have been ignorant of that conspiracy at the time. It has been amply demonstrated that this terrorist plot masterminded by Posada involved the complicity of members of the CANF military group in Miami, providing decisive support in executing those actions. None of their members has been investigated, despite plenty of evidence.